Works by treating the the causes of crooked teeth, avoiding the need for braces and extractions. Find Out how Dr Kanikevich can help you achieve straight teeth - without braces today! We here, at Bondi Dentistry, undertake paediatric dentistry. Not only do we specialise in Myofunctional and General Paediatric Dentistry, we also offer rebate-only payments for all our patients under the age of 18. For all our under-18 patients, covered by private health insurance, are offered many restorative and preventive services with no out-of-pocket expense. This includes your regular scale and clean, fluoride applications, X-Rays and fillings. This means that as long as your health fund pays a benefit amount for each treatment claimed, and you have not reached your annual benefit limit, we will accept the rebate paid from your health fund as full payment so you won’t have to pay a cent out of your own pocket. We’ll make the claim on the spot using our HICAPS terminal. For further assistance with the Child Dental Benefits Schedule please visit the Department of Human Services website. At Bondi Dentistry, we offer rebate-only payments for all treatments^ carried out for children covered under the Child dental Benefits Schedule. ^offer valid for treatments only. Any products used/purchased, will be charged according to surgery pricing. Orthopaedics involves early interceptive orthodontic treatment and can be initiated on many types of bite problems before all of the permanent teeth are present. Orthopaedic treatment is necessary in many cases when the child’s teeth, lips or jaws are not developing normally for their age. Most of these appliances are removable, making them easy to clean and allowing their wearer to keep their teeth clean, though fixed alternatives may be required to improve compliance and enhance treatment. Determining whether a fixed or removable solutions is required is dependant on the patient's needs, and will be discussed during your consultation with Dr Kanikevich. Your child's orthopaedic growth and development is extremely important and the early prevention of problems arising as a result of developmental bad habits is the best way to ensure you are giving your child the change to achieve their maximum potential. Additionally, preventive treatment is significantly less costly than traditional orthodontics once all their permanent teeth have grown. The exact type of treatment for your child depends on a thorough examination and diagnosis of the problem and treatment during this Orthopaedic phase may range from simple supervision and guidance to the use of fixed or removable appliances. Early treatment can prevent the need for braces. The Infant Trainer TM - has three main functions; to provide gentle exercise for the jaws and facial muscles via four independent Air Springs, to retain the tongue for correct positioning and swallowing and to encourage correct breathing through the nose. 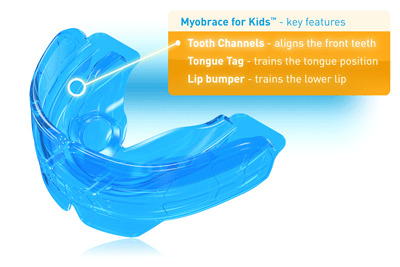 Myobrace For Kids TM - this is a three-stage appliance system designed specifically to correct poor oral habits, while treating upper and lower jaw development problems. The optimal treatment age using the Myobrace System is from six to ten years of age, when the child is still developing. Treatment works best when combined with arch development and Myolay if necessary. Quite often Dentists or Orthodontists do not recommend any treatment before the age of 13; rather advising patients and parents to wait until all permanent teeth are present, and to then treat with braces and extractions. But braces and extractions do not address the real causes of crooked teeth and quite often once they are removed, the teeth crowd up again. Myobrace for Kids™ targets the underlying causes of crooked teeth as soon as the problems are evident, while the child's biological adaptability is at their peak. Improving these poor myofunctional habits at an early age allows for the child to have good dental alignment and improved jaw growth. 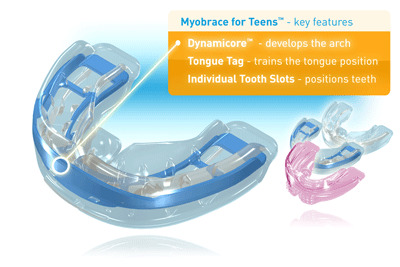 Myobrace for Teens™ - is a no-braces alternative to straightening teeth. Treatment involves using a series of removable orthodontic appliances combined with daily exercises to train the oral muscles and produce straighter teeth and a healthier smile. The underlying causes of crooked teeth are poor muscle function. Mouth breathing, swallowing incorrectly, and overactive facial muscles can all contribute to teeth becoming crooked. Once these habits are improved, much less force is required to straighten teeth. Myobrace treatment is simple. It does not involve wearing braces or using complex and uncomfortable dental appliances 24 hours a day, seven days a week. Wearing a Myobrace appliance for one to two hours each day and while sleeping, combined with a few simple yet effective exercises each day is all it takes for a real change to occur. 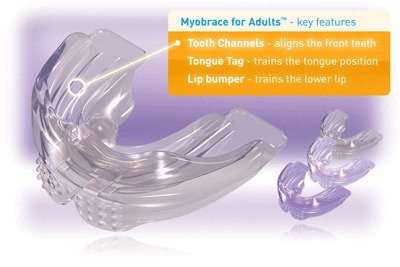 The Myobrace for Adults™ works to align the teeth and correct poor oral habits. These are the real causes of crooked teeth and poor jaw growth. This process can straighten teeth without the need for complex retainers or braces. If you suffer from a clicking jaw, frequent head or neck pain, or grind your teeth, then you may have a TMJ (jaw joint) problem. Some Myobrace Providers can also offer patients treatment for these problems. Learn more about TMJ disorder by clicking on the arrows below or above and visiting the 'more info' section.